Get some extra cash for whatever you need with a personal loan from Launch FCU. A personal loan can be used for many purposes such as home repairs, a vacation, a computer purchase, taxes and more. Launch FCU personal loan rates are low, and can even be deducted from payroll. We offer three types of personal loans: Signature, Line of Credit, and Savings Secured. For more information on specific personal loan products, please view the tab boxes below. Or, call a loan specialist at 321-456-5441. Rates based on term of loan. No collateral necessary. Apply for your personal loan online using our easy web loan application. Applying online for a loan has never been easier! Apply from the comfort of your own home, on the go, or wherever you are. Apply online now! Apply quickly and easily online, or at any of our convenient branches. If you have any questions about which Personal Loan is right for you, feel free to give us a call at 321-456-5441 (inside Brevard) or 800-662-5257 (outside Brevard). *APR = Annual Percentage Rate. Rate as low as 8.25% APR. Loans subject to credit approval. The rate you pay will be based on your credit history and approximate term. If your risk profile puts you in a higher risk category your rate may be higher. Payment and term affected by amount financed. Certain terms may not be available for all risk categories. Savings account required for a loan. 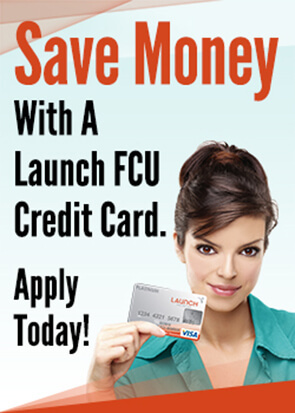 Only a $5 minimum deposit required to open an account and become a Launch FCU member. You can open an account if you live, work, worship, or attend school in Brevard or Volusia counties.